Wavewalk’s patented kayaks offer better mobility than other kayaks since they can be launched, paddled, steered and beached more easily. 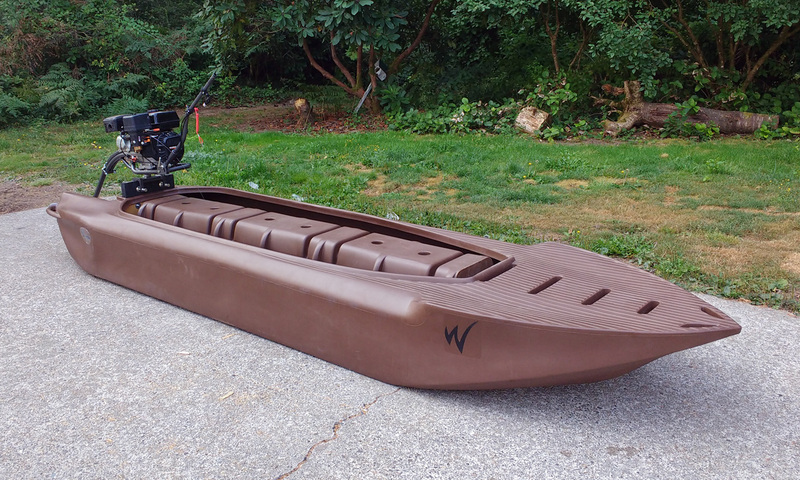 Wavewalk’s portable boats offer better mobility than other small craft, since they can be launched and beached anywhere, they are more seaworthy, they draft less, and they can be paddled effectively with kayak and canoe paddles. Went hunting yesterday and it was the first time I was able to get my retriever out. Mixed results, she actually started getting a bit shy of the gun, which will take a lot of work to fix. Definitely fixable but a bit more work before she is in the next video. It was just Torri and I so I used the W700. 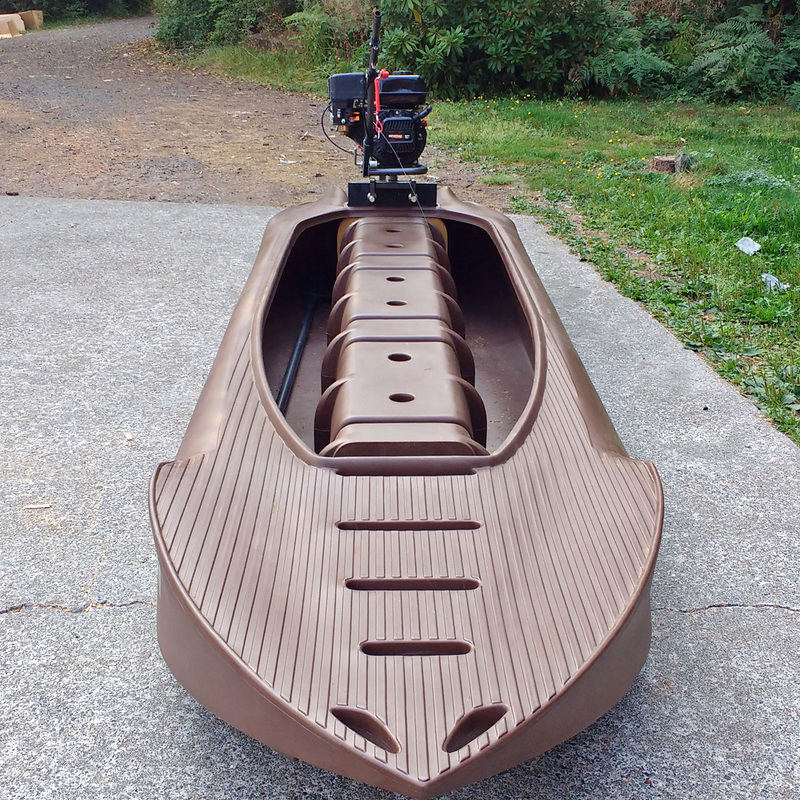 It is a trusty platform for getting to the duck hunting spot and my go to boat. 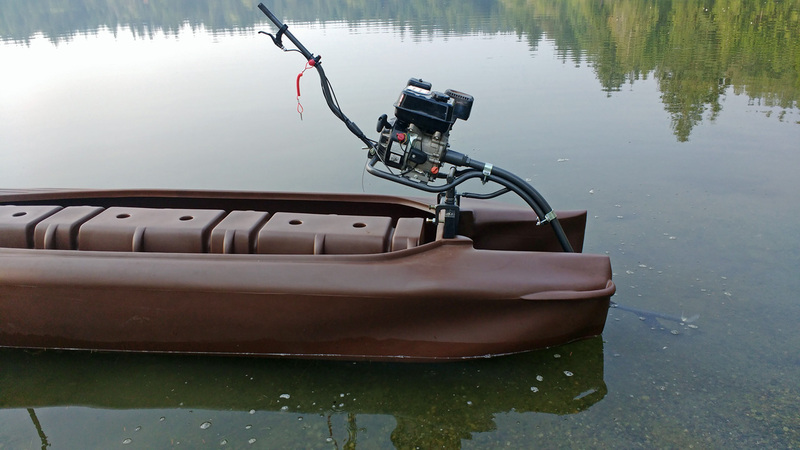 Others with motors and heavier boats dare not tread where we hunt (in truth they would sink trying to pull the boat across the mud the 700 is heavy enough!). But it was a bright sunny day and the water was like glass. I even had a cup of coffee while the current took me back to the ramp. Today I was able to do my first test drive of the Wavewalk S4 with a mud motor! As a duck hunter the potential for the S4 is incredible. Couple that with a mud motor and you can access places that others cannot go. 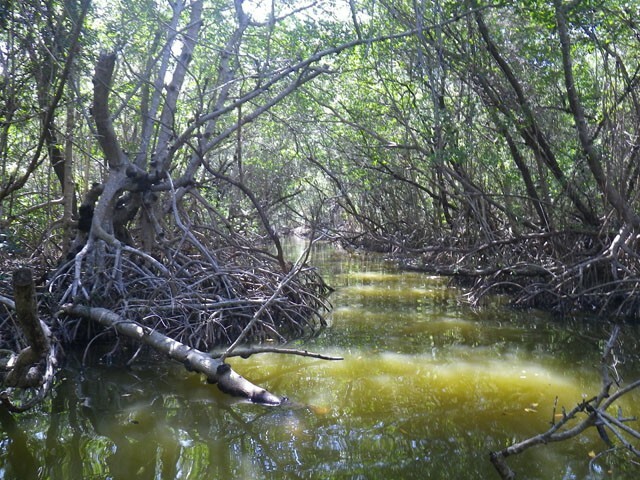 I hunt tidal mud flats where traditional boat motors are difficult to use due to the changing tides (water depth) as well as the sand bars that constantly shift. 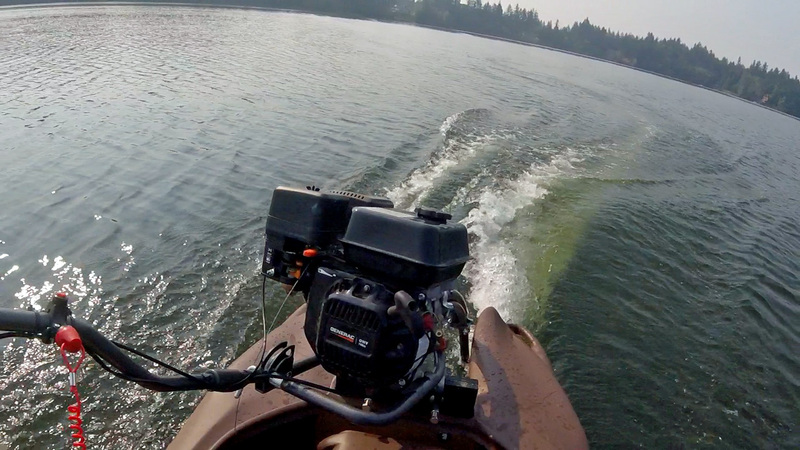 The mud motor allows operation in very shallow water and lets me get over those sand bars. Other duck hunters hunt in flooded timber where the logs eat propellers for lunch and occasionally eat whole lower units. The mud motor is the only way to travel safely in those kind of swamps. That is why putting a mud motor on the S4 is like combining peanut butter and chocolate. This was my very first run, so I have a lot to learn about operating this kind of motor. 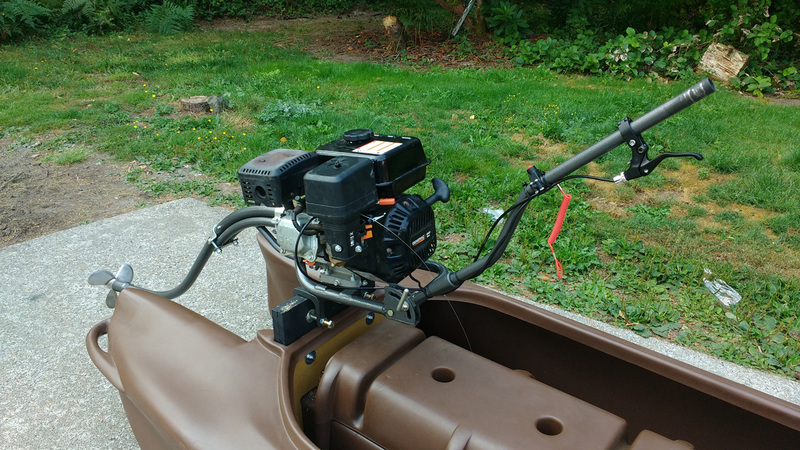 There are a lot of different styles of mud motors out there and the cost can be very prohibitive. But I found a kit which is created by Mud-skipper called the Twister. Rather than a straight shaft it has a curved shaft. 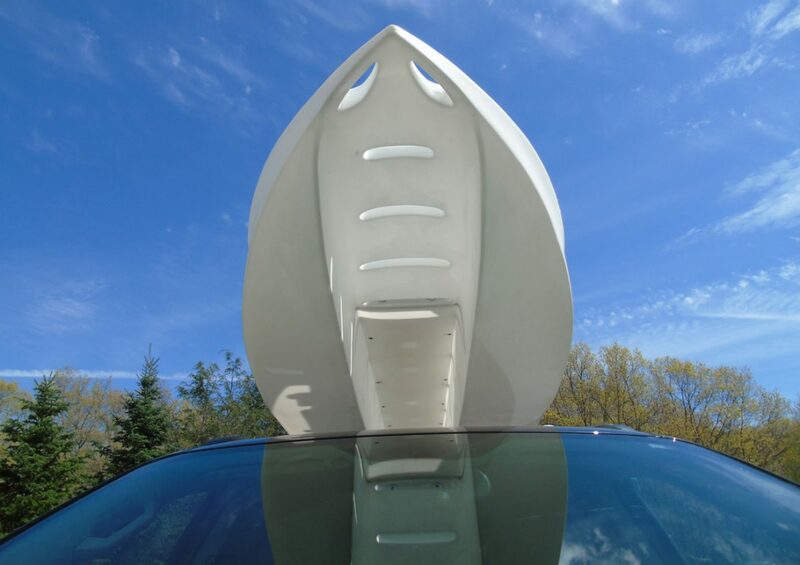 At first I was concerned that due to this the turning radius of the boat would be dramatically effected. As it turns out that fear was unwarranted. The two hulls actually keep you from turning too sharp which could cause you to overturn considering the nature of how the motor turns. The 6.5 hp was plenty of horse power and I cavitated way before I ran out of power. Lots of experimenting to do to get it all dialed in but it was a great first test run. Wavewalk hasn’t offered a pedal drive with its fishing kayaks because of two reasons, which are that we found neither demand for such accessory among our clients, nor any real advantage in offering such a device to them, regardless of the increased price we would have to charge for it. 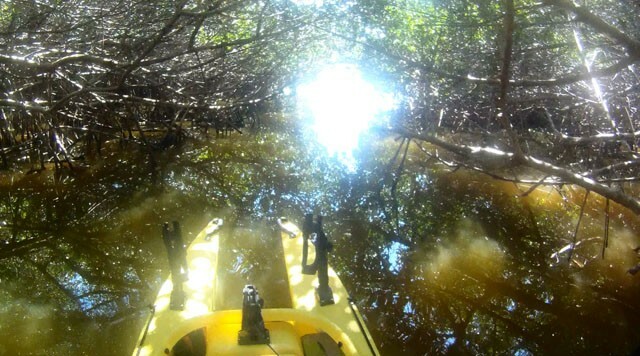 Years ago, we published the results of our research on this subject in a 4,000 word Paddle vs Pedal Drive in Fishing Kayaks article, which hasn’t gotten much interest from our clients. The reason we now publish this new, shorter article on this subject is to make sure that our clients are exposed to all ideas and possibilities, and have a chance to express their views on this subject, as well as their wishes, if any. Our new 700 series offers to incorporate a pedal drive more easily than the 500 design did. On the other hand, two out of the three pedal driven fishing kayaks manufacturers mentioned in our first article have suffered serious setbacks in recent years, while some of the pro-staffers affiliated with the third manufacturer express themselves with so much zeal that it makes them look like members of a cult, and this is not a good sign, in our opinion. 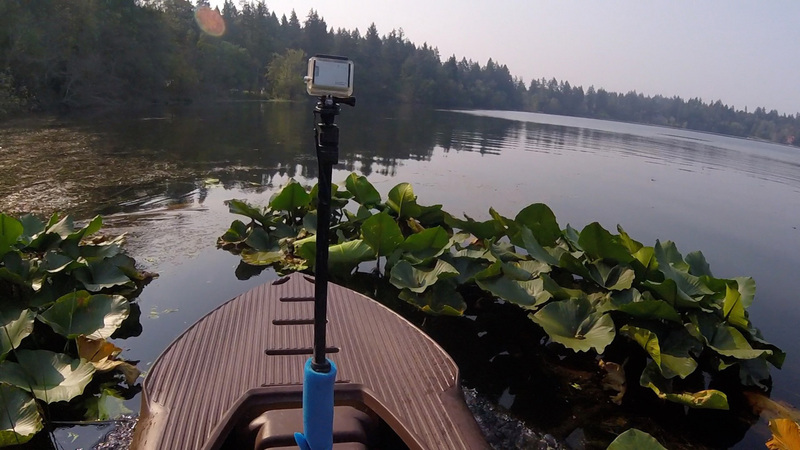 A fourth kayak company recently announced that it was planning to add a pedal drive to its line of SOT fishing kayaks, but a video they released revealed nothing more than a ‘me too’ version of the two existing rotational drives. 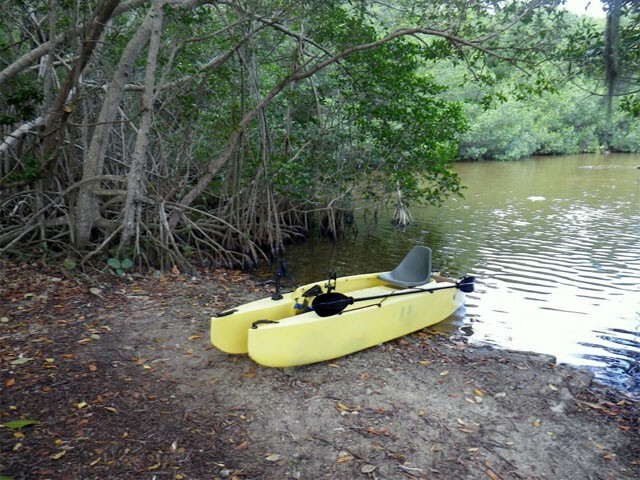 Practically speaking, none of the kayak pedal drives on the market can be used without a rudder system, and no pedal kayak fisherman goes on a fishing trip without taking a paddle with them. -Where can I go without restrictions? 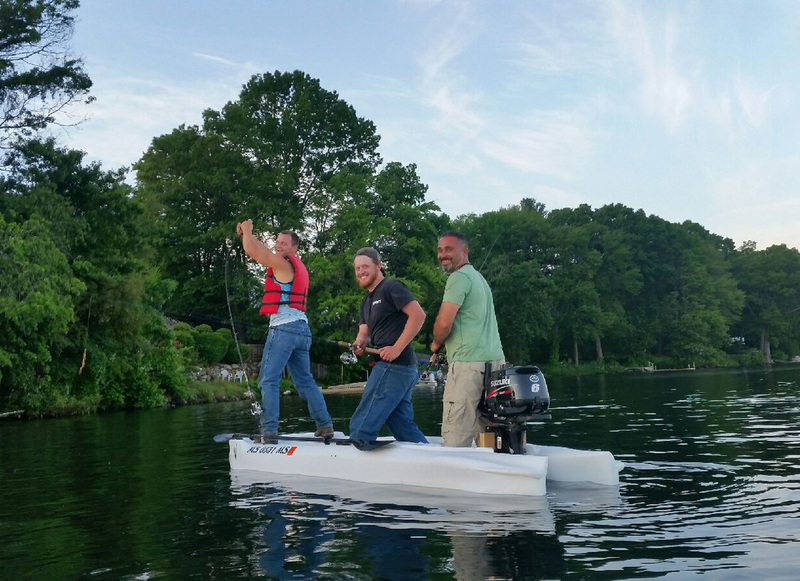 Again, using a kayak outfitted with a pedal drive automatically means that you need to use a rudder system, as well as take a paddle with you, just in case. This table refers to typical, several hour long fishing trips, and it does not show the fact that the W700 offers full tandem capabilities standard, at any time. Put the W thru some glades back country. We had no particular plan except to make it into Coot Bay. The weather was so nice that we continued into Mud Lake. We had a blast. We spotted some fish but had no luck catching anything. I remembered that the W has incredible stump jumpin’ capabilities that I have never tested. The W 500 performed brilliantly in the tightest of tunnels. Editor’s note: The above movie is a must see. Watch in full screen mode!